I’m not one of those scribble-on-napkins authors. I’ve never been able to write my story ideas on whatever scrap of paper is handy, because I’m so paranoid about it getting lost. When I was younger, I had specific notebooks devoted to specific story ideas, and not one of those notebooks could ever be spoiled with anything other than its designated story. It just couldn’t be done. 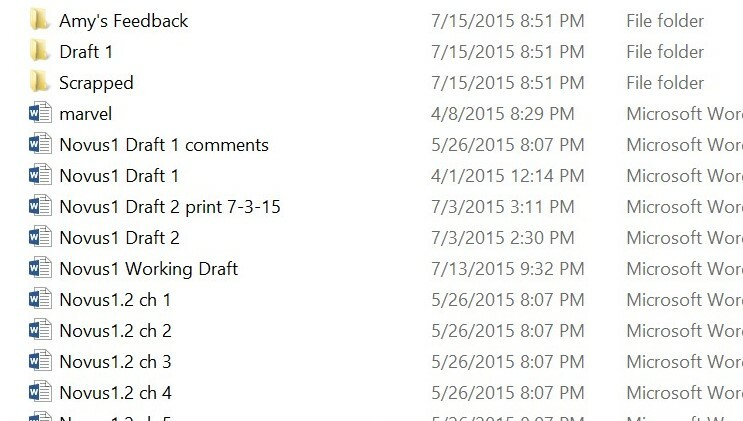 For years now, though, I’ve been writing on the computer, and I love my layers and layers of files neatly organized by story, type, and draft. I have files from middle school in this folder, guys. It literally has my life’s work in it. When I finally gave in and got a new computer a couple of months ago, I thought it might be time to trim away some of the excess bulk. Because really, who needs 90 folders containing 1,111 files? Well, I do, as it turns out. I had no idea how often I refer to older drafts and older story ideas to shape what I’m writing. I don’t just pull from the fourth draft to write the fifth draft; I pull from all previous incarnations of the story, including pre-drafts when it was a completely different story altogether. And then maybe I pull a few aspects from a story I trashed years ago, and then I get some inspiration from a story that’s been simmering on the back burner for a while. 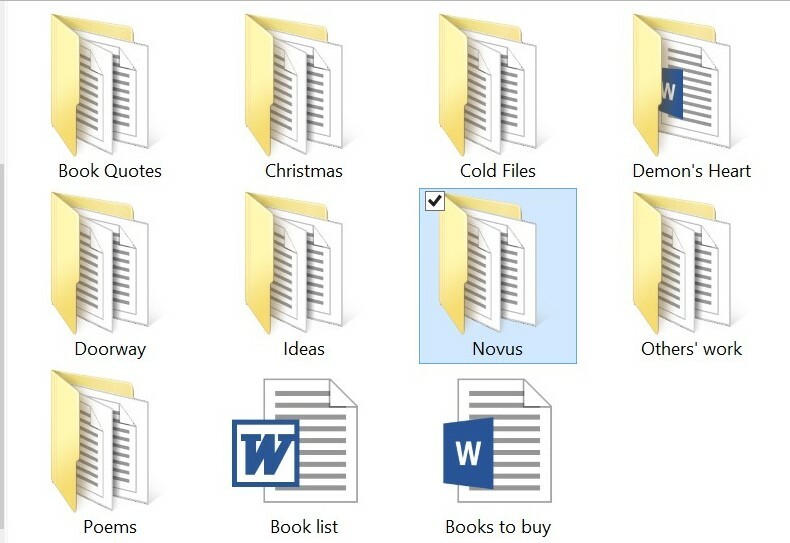 So yesterday, I did a little cleanup to get it down to 1,035 files, reorganized my folders to make the first window a little less overwhelming, transferred it all over to my new computer, and breathed a sigh of relief. Now I’m ready to get back to work. Take a peek a few levels deep into my endless spiral of story folders . . .
New and improved welcome page of my Stories folder. Diving into my NOVUS series . . .
. . . and book 1 of NOVUS, 2.5 drafts in. How do you keep your writing organized? Or are you more likely to let your pages fly loose? Do you look back at past (and way-past) drafts, or do you let them gather dust?